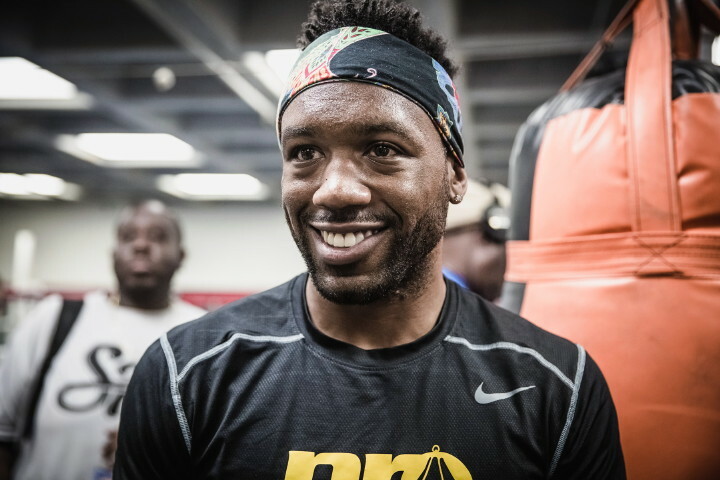 (Photo credit: Stephanie Trapp/Mayweather Promotions) By Dan Ambrose: #7 IBF Austin Trout (30-2, 17 KOs) has got a very tough fight ahead of him this Saturday night against unbeaten IBF junior middleweight champion Jermall Charlo (23-0, 18 KOs) in their fight at The cosmopolitan in Las Vegas, Nevada. The Charlo-Trout fight can be seen on Showtime Championship Boxing. The start time is at 9:00 p.m. ET. Trout, 30, is starting to get up there in age. If he loses this fight to Charlo, it could take him a long time to reset his career again. As it is, Trout has been rebuilding his career for the last three years since his back to back losses to Erislandy Lara and Saul “Canelo” Alvarez in 2013. The southpaw Trout has won his last four fights against weak opponents in Daniel Dawson, Luis Galarza, Luis Grejeda and Joey Hernandez. Those fighters are not major players in the 154lb division, and Trout looked poor in three of those fights. The last time Trout really shined in a fight was four years ago in his narrow 12 round decision win over Miguel Cotto in December 2012. That win was clearly the high point of Trout’s career, as he caught Cotto at the right time just after he’d been beaten by Floyd Mayweather Jr. Cotto didn’t have the same confidence that we’ve seen from him since he started training with Freddie Roach. That version of Cotto would likely have beaten Trout badly and knocked him out. It’s about timing in the sport, and Trout clearly fought Cotto at the right time. The 26-year-old Charlo is the wrong fighter at the wrong time for Trout. Many boxing fans see Charlo as the best fighter in the 154lb division right now. He’s the more dangerous one of the Charlo twins. Charlo’s brother Jermell Charlo is unbeaten like himself, but he doesn’t have the same one-punch power that Jermall possesses. The two of them look alike, but they are completely different fighters. Jermall is a knockout artist with huge power in either hand; whereas Jermell is more of a pure boxer with decent but not great punching power. Trout would have a chance at beating Jermell Charlo, but he’s going to be over-matched against Jermall on Saturday night. Jermall not only is a much bigger puncher than the 5’9” Trout, but he also has faster hand speed, and is taller than him at 6’0” with a slightly longer reach. One of the advantages that Trout has had going for him in many of his fights during his career is his height and reach, which has allowed him to stand on the outside and bang away against shorter guys. On Saturday night, Trout won’t have that going for him in this fight against Charlo because he’ll be giving away three inches in height to the unbeaten Jermall. Charlo, 26, will be making his second defense of his IBF light middleweight title that he won in September 2015 in stopping champion Cornelius Bundrage in the 3rd round. Charlo looked like a brute in the Bundrage fight in knocking him down four times in the fight. It was like watching a young George Foreman blow through Joe Frazier. Bundrage could not stand up to Charlo’s devastating punching power, and he found himself getting dropped again and again before the fight was eventually stopped in the 3rd round after two knockdowns in that round. In Charlo’s first defense of his IBF title, he destroyed an overmatched Wilky Campfort in a fourth round knockout last November. Charlo took his time in that fight and appeared to be coasting rather than putting in any real effort to try and get a fast knockout. This will be a fight but I don’t think it’s going to go well for Trout. He’s facing the wrong type of opponent for his skillset. Trout does better against fighters with moderate punching power like himself. He’s a tricky fighter and can be difficult if he fights someone that isn’t a strong puncher and isn’t blessed with a lot of height. Charlo is the wrong type of opponent for Trout’s natural skills and his size. I think we’re going to find out early on Saturday night that Trout picked the wrong champion to go after. You’ve got to respect Trout for having the courage to take on Jermall, but he’s going to be exposed in that fight and shown that he doesn’t belong in the same ring with him. It won’t be the end of Trout’s career in him losing to Charlo. I think it’ll be more of a case of him having a wakeup call that he needs to target the weaker guys like the winner of the Jermell Charlo vs. John Jackson fight for the WBC 154lb title or WBO champion Liam Smith. These are all guys that Trout would have a reasonable chance of beating. Jermell might be a little bit too much for Trout though, especially with the way he’s now making more of an effort to sit down on his punches than he had in the past. It won’t be surprising if Jermall Charlo stops Trout in the first four rounds of the contest. Trout has looked chinny since his fight against Canelo in 2013, and Jermall is clearly a bigger puncher than Canelo and the guys that Trout has faced in the last three years. Trout was knocked down twice by Daniel Dawson in the third round of their fight in August 2014, and Dawson is not considered to be a puncher. Those knockdowns weren’t a fluke thing. Dawson hit Trout on the button and dropped just like he did in his fights against Canelo and Erislandy Lara. Trout was down in the 11th round by Lara in December 2013, and in the 7th round by Canelo in April 2013.